Number 26 on the 100 Things list is to help a stranger. This I was initially able to achieve after being asked by a concerned mother to address her daughter’s school about the topic of bullying. Her daughter was sadly a victim of bullying and being able to help in small way by sharing stories of my journey left a lovely memory with everyone involved. Shortly after this I met a man by the name of Mark. Having fallen victim to an undiagnosed neurological disorder, Mark sadly found himself confined to a wheelchair 24-7 with virtually no movement. After seeing me on a TV interview Mark decided to contact me and told me that he had his very own bucket-list. Not only this but he wanted me to help him tick off an item from his list. 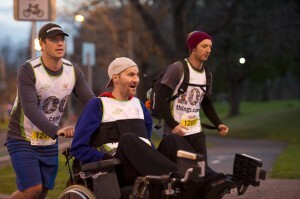 This I did by pushing him in his wheelchair for the duration of the Melbourne Half Marathon- he had always dreamt of completing a half marathon! The satisfaction of helping Mark and seeing the joy on his face having accomplished an item from his list convinced me that this was the direction this 100 Things journey was taking- helping others. I decided then and there that i would help as many people as possible tick-off items from their list, hence keeping item Number 26- Help a Stranger, alive! This page is dedicated to these stories. I hope this list becomes even longer than my own and if you think you would like to help me help somebody or indeed know someone who needs help, please let me know. If you know someone who could do with a helping hand, please let me know.